The AmeriSuites Hotel offers 285 Suites with refrigerator, microwave, wet bar, coffeemaker, voice mail services, dataport telephones and 26" color televisions with video cassette players. Located just 1/2 mile from the famous Las Vegas "Strip", across the street from the new Hard Rock Hotel & Casino, the AmeriSuites offers an array of activities. Also nearby, the MGM Grand Adventure Theme Park, The Forum Shopping at Caesars Palace, University of Nevada at Las Vegas, McCarran International Airport and the Las Vegas Convention Center, to name a few. AmeriSuites offers complimentary deluxe continental breakfast daily to start your day off right and a Managers Reception in the evening to relax by. 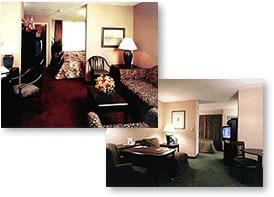 The hotel has an outdoor heated pool, fitness center, free shuttle service, meeting facilities and a Business Center. The 3,691 square feet of flexible meeting space can accommodate up to 80 persons for your business meetings.